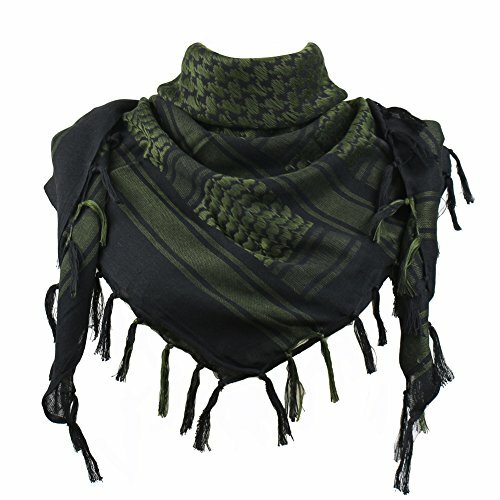 Explore Land 100% Cotton Shemagh Tactical Desert Scarf Wrap (Black and Green) | What Should I Say? 2. Made of 100% cotton, high quality woven material. 3. Thick material, net weight: 6.35oz. 4. Soft and warm to protect your face and neck from sun, sand, wind and dust. 5. Great for hunting, shooting, hiking, climbing, motorcycle and paintball game. 1. With the shemagh completely open, match one corner with the corner diagonally opposite from it, folding the square in half and into a triangle. 2. Pull the folded edge of the shemagh over your forehead, positioning it somewhere between your hairline and your eyebrows. 3. Pull the right side around to the left so that it wraps completely under your chin. Pull the end over your shoulder and toward the back of your head. 4. Grab the leading or folded edge of the left side with your right hand and pull it all the way across your face, toward your right side. Unlike the right side of the shemagh, this left side should drape across your nose and mouth, not under your chin. 5. Use a tight overhand or double knot to secure the shemagh in place. This knot should be at the back of your head, roughly around the back center, and it must be tight enough to keep the shemagh on your face. 6. Adjust the shemagh as needed so that the material covers the top of your head and lower half of your face without covering your eyes. After this step, the shemagh is complete. If you have any questions about this product by Explore Land, contact us by completing and submitting the form below. If you are looking for a specif part number, please include it with your message.